In sessions, there are a variety of types of equipment you can use. Some of these you may know what they are and why they are used, others you may be puzzled by. To remedy this, we’re giving you the full run-down of some the standard equipment used at Conductive Care Ltd. 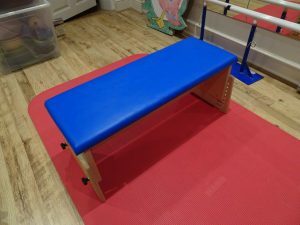 The first piece of equipment used is a bench or stool. This can be a specialist therapy version or can be something a child already has in their home. These are used to practice box sitting and the balance and core stability needed to maintain a sitting position on a stool/bench. We carry out these exercises, because children with disabilities such as Cerebral Palsy may have less control/ability with their core muscle and their balance, including their proprioception of what’s going on around them and whether there is something behind them or not. Ladders are used for standing and balance exercises. The children hold onto the wooden bar and use it to not only balance themselves in standing, but also help them push up from sitting. 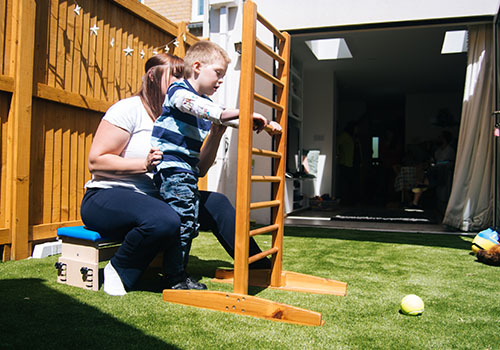 A ladder is a versatile tool in therapy, as it doesn’t need to be changed for different heights, and the children can use the appropriate level of the wooden bar for them. It can also be used to help children crouch down to the floor. This is achieved by the child gradually lowering themselves using the different bars and the same back up to standing. 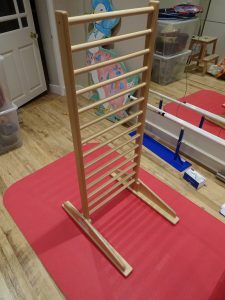 Another use has the children able to practice stepping up, where a child will hold onto the ladder and lift either of their legs up and step onto a lower bar. This can help them learn to transfer their weight to either leg and therefore help with stepping. A great use for a ladder, after standing, is to help a child learn how to walk. It’s a bigger piece of equipment and this gives the child more stability when moving across the room. This does however require someone to be behind them, helping them where needed to balance and step. The ladder is an amazing piece of equipment to improve and support a child’s walking development. A real must have, we would say. This is another big piece of equipment which can help a child’s standing, stepping and walking. 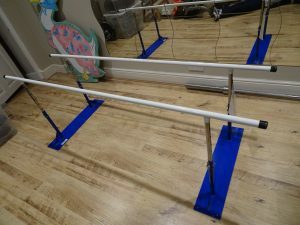 The bars either side can be set at any level and a child can either stand and hold onto one side of the bar, facing the parallel bars, or stand in the middle holding onto a bar on either side. For stepping a child can learn to step to the side along one side of the bars, and can go in either direction, working both sides of their body’s ability. When walking using the parallel bars, it is done through the middle of the two bars. This is different to a ladder as a child will have their hands by their side, instead of in front of them, and must move their hands as they move through the bars. This is a more difficult action, but a great task to improve their walking ability. Walkers are different from the other types of equipment and are specific for every child. 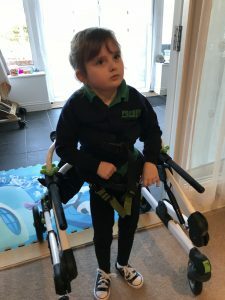 They are something we use so a child can have the opportunity to independently walk and not have to worry about controlling other parts of their body, as they are much more supported. Various types and makes of walkers exist, which we will go into more detail about in another blog. For now, we will focus on our favourite, the Grillo. This walker is a smooth and easy make to use, which can be changed continuously over time to help a child less and less. Meaning the user can do more at a different level. Now there are many other small pieces of equipment we use on a day to day basis, but for now we don’t want to overwhelm you with too much information. Watch out for more posts like these in the future. In relation to that, we intend to start building lists over the next few weeks about the equipment we use with short descriptions, including why or how it is used. If you want to know more about something, please let us know and we can add it to our list. We hope you now understand a bit more about what we get up to on a day to basis, as well as understanding more about how our work affects the lives of children. Thank you for reading!